You can use any size yarn, with an appropriately sized hook, to make these stars. They also need a small amount fiberfill, if you'd like them to be puffy. Fasten off. Leave a long tail for sewing sides together. Weave in center tail. Sew sides together. Add stuffing before sewing last 1/2 inch, if a puffy star is desired. I spent a couple of days crocheting and putting these little stars together. They have completely grown on me, and I've been inspired to do a couple of other projects with them. So, while it's not a theme week, I hope you'll be as excited as I am to spend a couple of days Crocheting With The Stars! 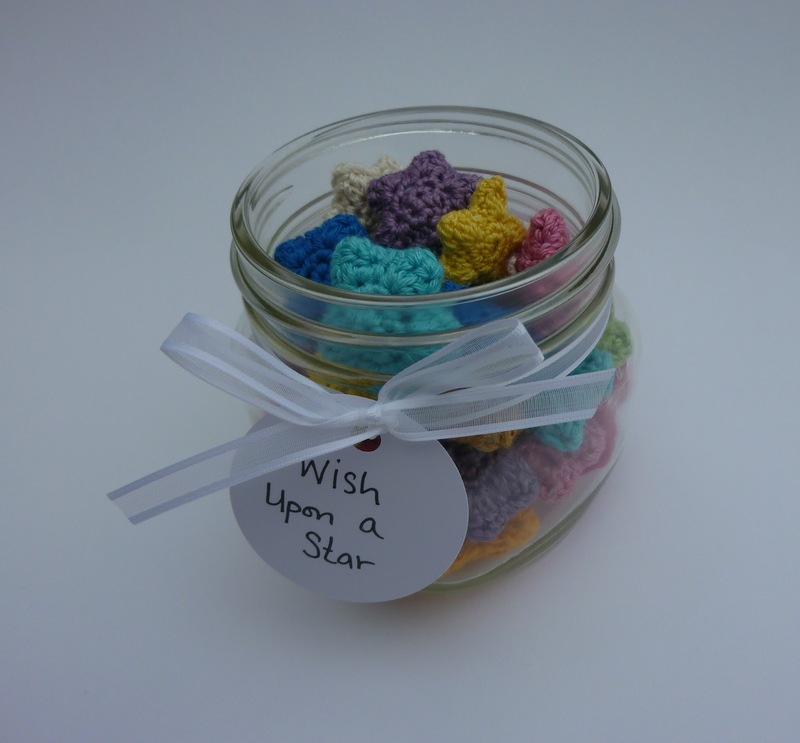 If you'd like to fill your own jar with wishing stars, it took about 30 stars to fill the jar. I made mine out of size 3 crochet thread, and used a size D crochet hook. A jar of stars! Sorry you didn't place at the fair. I submitted an afghan in our county fair years ago and was disappointed that I didn't place either. Some 'senior citizen' crochet won! The bag that won was so gorgeous, and there weren't any awards beyond the 1st place ribbon, so I didn't feel too bad about it. In my heart, I was clearly 2nd... LOL!!! Thanks for being so supportive!!! What a wonderful pattern! I have to make some of these. Hi Nyan! They are ridiculously cute in real life, and they are super quick to make! I made mine while I watched movies at night. You, of course, are free to make yours whenever you'd like... LOL!! If you do make some, send me a picture! I'll put it in my Dynamo Gallery and link it to your awesome blog!!! Such a darling idea! I am soglad to have happened upon your blog! Hi Aly! I'm so glad you came by and checked it out! I love your blog! Your Boos are adorable! These are great, you can also leave a small hole and either glue them onto the ends of your pens (or crochet covered pens) and you can use them unglued to use as pencil erasor toppers. I would like to see pictures of your finished business cards, if you decide to post and entry on that. Curious how the end result turns out. I'll bet they look great too. Yes! My mom made some and left holes in the bottom so that she could use them as finger puppets in her classroom next fall. Great tips ♥Piper♥! I just got an email yesterday that my business cards have been shipped and should arrive next Monday! I am so excited, I think I'm going to have a giveaway. A giveaway would be exciting. Ooh, ooh, I'm with Piper, I want to see the cards! (I also think Piper has an adorable name.) I always have to have little somethings stashed in my purse for when I'm waiting around for something (read: for my sweet hubby to finish cruising the electronics section of any store) so these are gonna replace my ubiquitous granny squares. And you've saved my tuchus at Channukah because I have a friend whose last name is Starr so an excuse to be star-struck! (hahaha! I kill myself...) I'm thinking it would be fun to put a thumbtack into one star before attaching the 2nd and filling them, to make a jillion of them for her work cubicle. Thank you for the inspiration! Ooh, thumbtacks! I hadn't thought of that! I do have a couple more star projects coming that also would make cute gifts (or at least I think so...). In fact, the next 3 posts will be completely star stuffed! You crack me up too! COMPLETELY fell in love with this! my gf's name is star and every time she does something sweet i give her a gold star (corny i know!) and well now i can literally give her a gold star i love this. OMG OMG OMG!!! I.. I... I... I NEEED TO MAKE THIIIISSSSSSS D: (Having a moment)Thank you for your idea! 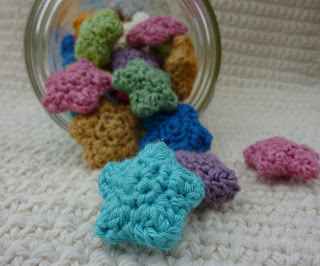 Now, instead of getting paper cuts folding stars, I can crochet them instead! Anyway... Thank you again so much!!!!! :-( How do you get the pointy tips? I love this pattern!!!!! definetly going to make these as little gifts. I have a question in regards to row 3. After you do each HDC,DC,TRC,DC,HDC, Do you slip stitch into the next stitch after that or is the slip stitch to close the round? I love this pattern! I’m going to fill a jar with these stars and add a larger crescent moon just because! My grandkids will love it!